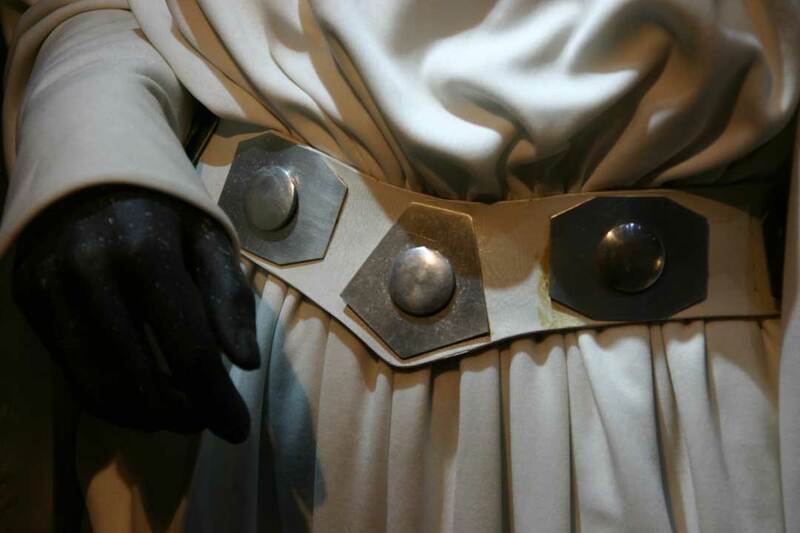 A good material to use for Leia’s belt medallions is aluminum flashing, it is inexpensive, (around 6.00$ for a 6X10 roll). The Flashing can be cut easily with hand scissors, and requires little or no sanding to finish. The round center part of the medallion can be made with cover buttons, (these are buttons that you cover with fabric yourself, however, when left uncovered they make good centers for the belt medallions.) Pam’s Costumes says that 1 1/8” size works well. The Costumes and Art Work blog, uses thread and a curved needle with a backing button to go through the cover button shank to attach the cover buttons to the medallions. Pam’s Costumes, used epoxy glue to attach the cover buttons, she removed the shanks and filled the backs with resin, hot glue could make a good alternative for filling the backs.